A 7-inch touchscreen comes standard on all 2016 Hyundai Sonata trims except the range-topping Limited 2.0T (which continues to have an 8-inch screen). Both systems feature smartphone integration via Apple CarPlay (late availability) and Android Auto. A rearview camera and automatic headlights are standard on all trims as well. An automatic emergency braking system debuts on the Limited 2.0T, while Hyundai says it has retuned the Sonata''s suspension for slightly improved handling. Vehicle overview Read enough industry reports (what, you don''t read industry reports?) and you''ll likely learn that crossovers are steadily supplanting the midsize sedan as the vehicle of choice for the American family. It seems that nobody bothered to tell Hyundai, though, as last year''s redesigned Sonata sells in greater numbers than both of Hyundai''s crossovers combined. But we''re not surprised. 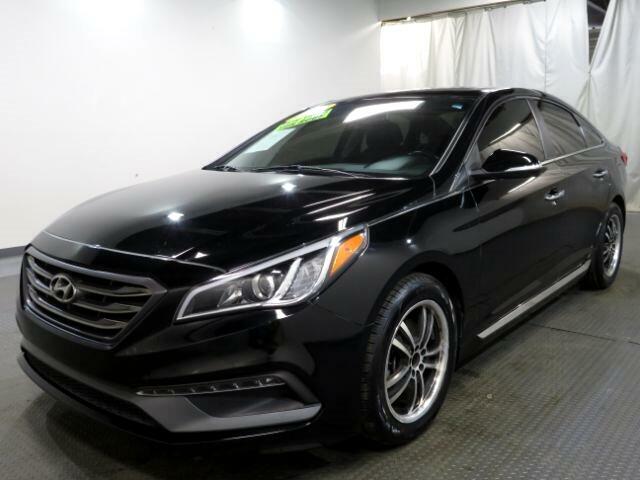 The A-rated Sonata is one of our favorite sedans in this class, and improvements to the technology interface and additional standard features make the 2016 Hyundai Sonata an even more attractive proposition ***Internet special. Price reflects discount for cash buyers. Traditional and special financing is available for qualified buyers. Please contact us first for availability as our cars go fast at near wholesale prices. Prices are subject to change. Sales Tax, Title, License Fee, Registration Fee, Dealer Documentary Fee, Finance Charges, Emission Testing Fees and Compliance Fees are additional to the advertised price. All options and conditions of the vehicles must be verified with the dealer, any descriptions or options that are listed maybe incorrect due to automatic data transfer.